There are currently more than 600 members. Full membership is open to veterinary surgeons, veterinary pathologists and medical pathologists who are active in animal pathology. Junior membership is available to anyone who is in a training or postgraduate position. Either your proposer or seconder should be able to confirm that you are in a training position. Junior memberships are for a maximum of five years; thereafter, the membership automatically becomes a full membership. Membership fees are 30 Euros for Junior members and 50 Euros for Full members. Please note that payment of registration fees by credit card will incur an additional €5 fee. It is also possible to pay by bank transfer; any bank charges must be paid for by the member. More information on payment will be sent to you once your application to become a member has been accepted. Please do not send money prior to receiving the specific request for payment. For further information on annual fees payments to the European Society for Veterinary Pathology, please write to the ESVP Honorary Tresaurer. Please complete the online form, providing contact information for yourself, ensuring that addresses and e-mail details are correct. You are also asked to provide contact information of two persons, who should be current members of the ESVP, who support your application for membership (a proposer and a seconder). Please ensure you have their permission to provide their names and email addresses, before you complete the online form. You are asked to upload a copy of your CV, which should include a list of publications, if appropriate. Your document can either be MS Word files (.doc, .docx), PDF (.pdf) or MS Excel files (.xls, .xlsx). The maximum file size is 5MB. During the application you may also enter a username to create a user account. For further information please read the next section. If you have any further questions, please contact the ESVP Honorary Secretary. For technical problems during the application process, please contact our webmaster. Enter your registration data. You will receive an email to your given email address with a link to verify your account. Within 48 hours an administrator will check your registration data in order to confirm that you are an ESVP member. Once your data is confirmed, you will receive an email that you are allowed to log in. In order to register you already have to be an ESVP member. If you want to become a member, you need to complete the online application form. For technical problems during the registration process, please contact our webmaster. The abstract submission has been closed. Deadline was June 1st, 2018. For questions please write to . 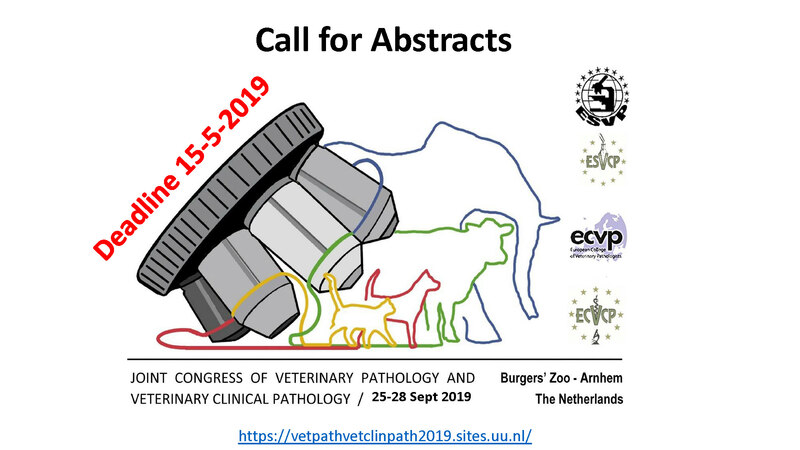 European Society of Veterinary Pathology e.V. The data collected on this website are processed by the European Society of Veterinary Pathology e.V. (ESVP). Contact details can be found under Notice concerning the party responsible for this website. You can register on our website in order to access the “members’ only” section of the ESVP website. The input data will only be used for the purpose of using the respective site or service for which you have registered. The mandatory information requested during registration must be provided in full. Otherwise, we will reject your registration. When applying for ESVP membership with our online application form, your personal data is only collected, used and passed on by the European Society of Veterinary Pathology if this is permitted by law or if users consent to the collection of their data. Members of the ESVP may apply to access the “members’ only” section of the ESVP website as part of the membership application process. When registering for access to this part of the ESVP website, the user’s details are stored for the purpose of processing the application as well as in the event of subsequent business of the Society. If you are an ESVP member, your personal data will be processed by the ESVP itself and in some cases the European College of Veterinary Pathologists (ECVP). Your data will not be shared with third parties without your consent. We consider the processing of your personal information for these purposes to be either necessary for the performance of our obligations with you, necessary for compliance with a legal obligation, or necessary for the performance of tasks we carry out in the public interest. If we require your consent for any specific use of your personal information, we will collect it at the appropriate time and you can withdraw this at any time. We will not use your personal information to carry out any wholly automated decision-making that affects you. If you have registered to the ESVP website you may administer what data you would like to have available by logging in to https://www.esvp.eu/member-login. You also have the right to ask us to correct any inaccurate personal information we hold about you or to delete personal information by contacting the ESVP Treasurer ( ) or ESVP Webmaster ( ). The ESVP will keep a record of your name, nationality and current contact details. Your personal information is created, stored and transmitted securely in a variety of paper and electronic formats. Access to your personal information is limited to ESVP staff who have a legitimate interest in it for the purpose of carrying out their duties. Your data will be stored for as long as you are an ESVP member. These instructions are a summary of the specific instructions given at each point of the online abstract submission process. They are presented here to facilitate abstract preparation before final submission. Ethics statement: Provide suitable information if your work required approval from an Ethics Committee. Authors: Provide details of each author in the order that they should appear in the abstract. Only the presenting author needs to provide an email and postal address. The department, institution and country (i.e. affiliation) is required for each author. The abstract can be a maximum of 250 words, including the subheadings “Introduction”, “Materials and Methods”, “Results” and “Conclusions”. The title, authors and affiliations are not included in this word limit and have no length restriction. Abbreviations: Unless commonly known, such as PCR or HE, spell out any abbreviations in full when first mentioned, followed by the abbreviation in parentheses. Tables, figures or literature references are not allowed. On the bottom of the abstract page is a field for acknowledgements, it is not included in the abstracts word limit. Use British spelling and spell check. Abstracts will only be accepted if written in clear and concise English. Your abstract will not be edited; you are responsible for any spelling, grammatical, and typographical errors. Material and methods. Describe your experimental work so that readers can understand how you conducted your research. Results: Present your results so that readers can understand the findings of your research. Conclusions: Emphasize any new and important aspects of your research and give any conclusion that can be drawn from them. Do not write: “will be discussed”. The body of the abstract should be 250 words or less, including the subheadings 'Background', 'Objective', 'Methods', 'Results' and 'Conclusions' (5 words). The title, authors and affiliations are not included in this word limit and have no length restriction. Please avoid tables and figures. No bibliography/references should be included. Embedded symbols or formatting should not be used. Basic symbols are okay to use. Abstracts will only be accepted if written in clear and concise English. Your abstract will not be edited; you are responsible for any spelling, grammatical, and typographical errors.